this is where it all starts. if you are already appalled, leave now. it only gets worse. the really important details on each race, and plenty of less important details too. who's winning, by how much and how we manipulated the results to get it that way. our big time supporters who threw so much cash at us that we have to reuse last year's prizes. Such an amusing photo that I had to share it. I found this photo on the Italian Rollerski Site: www.skiroll.it. It seems like there should be a humourous quote to go along with the picture, but I can't seem to get it just right. Send in your suggestions! We need more races this month! Send us yours! We've had races in Utah and New Hampshire. Check out the results on the Schedule & Results page. See the Overall Leaders on the Standings page. We keep on rolling . . . Faster than the Utah Jazz's exit from the playoffs. Harder than finding Metallica songs on Napster. More ludicrous than George W. Bush's environmental policies. And more fun than a bachelor party in Vegas. 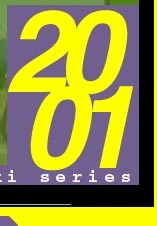 It can only be the 2001 International Rollerski Series. As the International Rollerski Series (IRS) enters its third year, the IRS Imperial Senate has decided to go all out and finally back up all the hype that the series generated last year. We want racing and we want lots of it. We want races from Maine to California, Canada to Mexico. We want high school kids, we want Master 12's (is there such a thing?) and we want everyone in between. There is only one problem. When we informed the IRS finance department of our grand plans to organize the greatest rollerski series on the face of the earth (thus placing us on a level equal with your kids' Little League team), we got laughed out of the office. We figure this was because either (a) we have no money (or a finance office for that matter) or (b) our flies were unzipped. So, not being willing to accept the social humiliation that goes with flying low, we chose to believe that we simply did not have the money to travel the country putting on rollerski races for every local team and club. This was devastating to our plans for the best IRS yet. But just as we were about to give up the whole thing and resign ourselves to hanging out in the parking lot by Wal-Mart and racing against shopping carts for kicks, we had an idea. . .
And this is where you come in. Since we can't go to races all over the country, we want the races to come to us. We want all of you to send us info on your own races. Is your team having a rollerski time trial this summer (or fall)? Do you want to have a race in your area and need to get the word out? We are here to help. 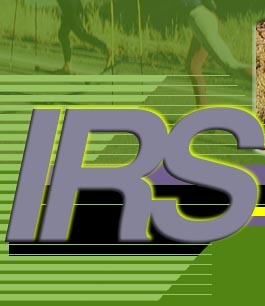 Send us info on your race ahead of time and we will post it on this website as an Official and Sanctioned IRS Race. Then, send us results after the race is over (a witty, well-written race summary complete with obnoxious diatribes and scandalous behavior helps too) and we will post the results and award IRS points to all competitors. Now, of course, we can't have every little Bjorn in the country racing his kid sister every afternoon just so he can win the prestigious IRS. No sir. So there will be certain criteria a race will have to meet. But don't worry, they are pretty lenient. Check them out on the Schedule page. As always, we will still have our fair share of races here as well, but we are ready to take this thing to the next level and we need your help to do it. 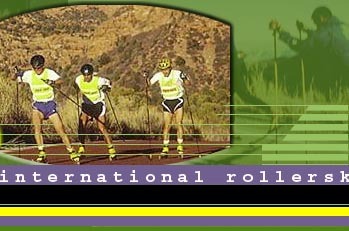 We will also do our best to scour the continent to bring you up to date info on all rollerski races. Even if you don't submit your race info, if we find out about it, we'll include it. 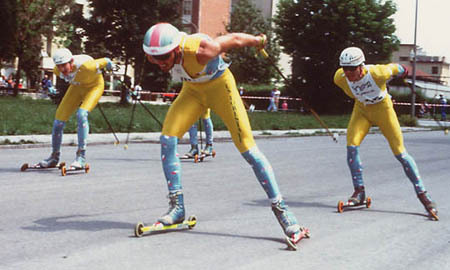 There might be people competing in an IRS-sanctioned race who have never heard of the International Rollerski Series (ah, to be so pure and innocent again). There could also very well be people who would rather avoid being associated with the IRS, but we are not above hostile takeovers of races to get the results we want. So take a look around on the site. Then, get your buddies together and organize a race. Show the world what you can do. Disclaimer: Despite what it may sound like, the International Rollerski Series, xcskiracer.com, and all affiliated parties do not condone rollerskiing. It is a dangerous sport and not really that much fun. Do not try rollerskiing unless you are a cross country ski racer. By participating in any of these events, you accept full responsibility for your own masochistic actions and release the organizers of any liability. We are not responsible for any injuries (including, but not limited to, broken bones, head trauma, road rash, and delusions of Per Eloffson-like grandeur) resulting from your participating in the IRS. Always wear a helmet and protective gear and don't fall. We are now in our third season of racing and general mayhem. Check out our checkered past. 6 hard-fought races and a scandal about magic poles. Lots of racing and even more infighting among competitors. And of course, don't forget our coverage in the press.